Swimming: Children enjoy swimming from April till mid October or until weather permits. Swimming classes are conducted under the supervision of the class teachers and guidance of fully trained swimming instructors and class teachers. Aerobics: This physical activity class is conducted by a trained Aerobics Teacher. Field Trips: Students are taken on field trips once during the year which serves to enhance their general knowledge. Baby Yoga: Baby Yoga promotes the feeling of well being in a child. We have a foreign qualified teacher who takes classes of children from Reception I to Preparatory level. Music: Music is a regular part of our learning program. These classes are conducted by a competent music teacher. Computers : As we are aware of the importance of information technology, children are introduced to computers at an early age. Lahore Preschool follows the ‘Fourth R’ computer training programme which is a recognised system of teaching computer skills to children. Students from Reception II onwards go to the computer lab regularly where different activities are designed in a way that their classroom learning is reinforced. 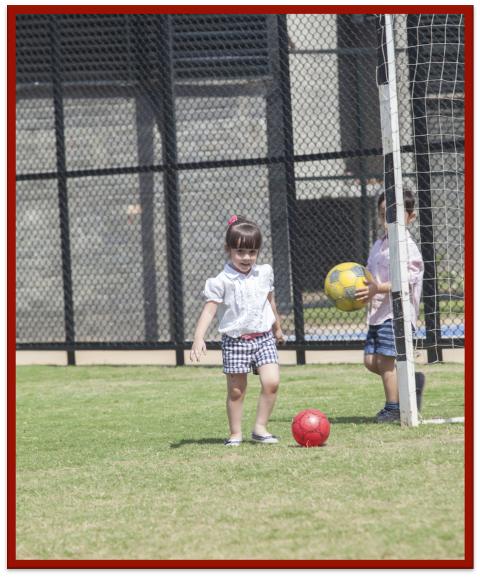 Learning while having fun is what Lahore Preschool is all about. Class Presentations: Children develop self confidence by enacting simple stories or concepts related to general knowledge topics. They put up these performances every term in the form of class presentations which are attended and appreciated by parents and grandparents alike. an additional tool for teaching. We have qualified Montessori trained teachers who apply basics of Montessori Method using the specified equipment.